Manufacturer & Supplier of Storage Tanks for Chemical Industry. Our product range also comprises of Storage Tanks, Roof Air Ventilator and Axial Flow Fans. 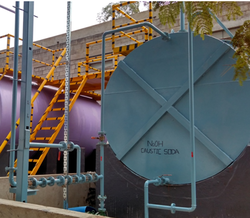 Owing rich industry experience, we have been able to manufacture and supply a wide array of Storage Tanks for Chemical Industry to our revered clients. In order to cater to the diverse requirements of clients, these containers are widely used in various industrial purposes. These are also available in varied patterns and sizes and can be availed by our clients, according to their demands and needs. Looking for Storage Tanks for Chemical Industry ?